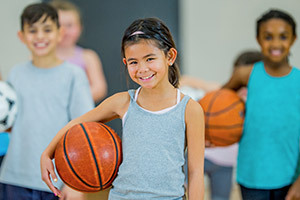 Consistently ranked among the top ten gyms for young people in Toronto, Mayfair Clubs Child Care & KidSpace makes it easy for the whole family to enjoy physical and mental fitness. Mayfair Kidspace is a very well maintained and professionally staffed gym for kids that is specifically focused on the youngest members of family. The facilities and programs are designed to pique a young person’s interest in their natural environment and allow them to express themselves in fine art, dance, music and cuisine. The weekly schedules are filled with team sports of every description; not one single day is ever quite the same at Kidspace. Fun times happen here! Mayfair Kidspace provides young people with a safe and healthy environment to make friends as they test their strengths and learn new powers. Kids here acquire new athletic abilities and excellent social skills; each day is filled with learning and laughter as our youngest members form lifelong friendships. Mayfair Clubs facilities offers premium health and recreation programs for the whole family. Our stress-free child care service lets parents feel comfortable leaving their children in our day care during their workout. Mom and Dad can feel secure in the knowledge their children are also enjoying their time at the gym. Mayfair Kidspace promotes positive learning in a safe environment with a healthy mix of events and activities to meet the individual needs of your children. We maintain a high level of cleanliness and make safety our number one priority as we dedicate our time and care to providing children with worthwhile and highly memorable experiences. Give a child the opportunity to expand their imagination through original art work. Let’s encourage them to think creatively and develop new skills along with a strong sense of personal achievement. There’s probably no easier way for young people to find their own personal style than with an easel and paint brush. The painted shapes, styles, textures and colours on canvas are the building blocks of character as youngest members grow into more unique individuals. Healthy for people at any age, but only available for kids at Mayfair Clubs Kidspace. Kids master food-preparation basics and taste the satisfaction of having made their own meals. Filled with delicious ingredients, this home cooked program teaches children about proper nutrition and how to grow muscles for life. Kids learn how food is digested and what exactly makes muscles in human bodies, and what types of food lead to weight gain. Kids acquire valuable kitchen skills under the guidance of our qualified child-care professionals. Your “Mini Chefs” will learn to make something different in every class and experiment to find their own favourite foods and good taste. See the latest family friendly films with your favourite Mayfair Kidspace staff and friends. Movie Nights can include snacks and drinks. Extended hours are available upon request with at least 48 hours notice to Laura Tichonchuk (westcoordinator@mayfairclubs.com 416 638 1010 x4248).